Immortal are a Norwegian black metal band that are currently based in Bergen. 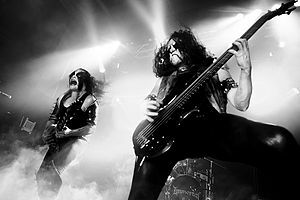 The band was formed in 1990 by vocalist Abbath Doom Occulta and former guitarist Demonaz Doom Occulta after the bands Old Funeral and Amputation disbanded and members from both of the bands joined together to make Immortal. Immortal disbanded in 2003 because of personal reasons but they reunited in 2006. They released their debut album, Diabolical Fullmoon Mysticism, on 1 July 1992. This page was last changed on 18 April 2018, at 05:03.